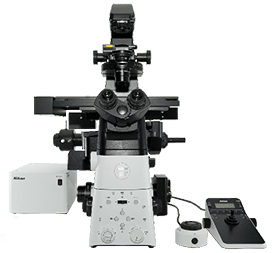 Inverted Research Microscope Eclipse Ti2 | EINST Technology Pte Ltd.
Nikon’s all-new inverted microscope platform for advanced imaging. See more than before! The Eclipse Ti2 delivers an unparalleled 25mm field of view (FOV) that revolutionizes the way you see. With this incredible FOV, the Ti2 maximizes the sensor area of large-format CMOS cameras without making compromises, and significantly improves data throughput. The Ti2’s exceptionally stable, drift-free platform is designed to meet the demands of super-resolution imaging while its unique hardware-triggering capabilities enhance even the most challenging, high-speed imaging applications. Furthermore, the Ti2’s unique, intelligent functions guide users through imaging workflows by gathering data from internal sensors, eliminating the possibility of user errors. In addition, the status of each sensor is automatically recorded during acquisition, providing quality control for imaging experiments and enhancing data reproducibility. In combination with Nikon’s powerful acquisition and analysis software, NIS-Elements, the Ti2 is a total innovation in imaging. Single FOV of cultured neurons, captured with a CFI Plan Apo lambda 60x objective and DS-Qi2 camera. Photo courtesy of J. Rappoport, Nikon Imaging Center, Northwestern Univ. ; Sample courtesy of S. Kemal, B. Wang, and R. Vassar, Northwestern Univ. High-power LEDs deliver bright illumination across the Ti2’s large field of view, ensuring clear, consistent results from demanding applications such as high-magnification DIC. Incorporation of a fly-eye lens design provides uniform illumination from edge to edge for quantitative high-speed imaging and seamless tiling of images in stitching applications. The DS-Qi2 high-sensitivity monochrome camera and DS-Ri2 high-speed color camera are equipped with large 36.0 x 23.9 mm, 16.25 megapixel CMOS image sensors, enabling maximum performance with the Ti2’s large 25mm FOV. Nikon’s high-precision CFI60 infinity optics, designed for use with a variety of sophisticated observation methods, are highly regarded by researchers for their superb optical performance and solid reliability. Nikon’s unique apodized phase contrast objectives with selective amplitude filters dramatically increase contrast and reduce halo artifacts to provide detailed high-definition images. Nikon’s highly-regarded DIC optics provide uniformly clear and detailed images with high resolution and contrast throughout the magnification range. DIC prisms are individually tailored for each objective lens to provide the highest-quality DIC images for every sample. Changes in sample thickness, cover glass thickness, refractive index distribution in the sample, and temperature can lead to spherical aberration and image deterioration. The highest quality objectives are often equipped with correction collars to compensate for these changes, and precise positioning of the collar is critical in achieving high resolution, high contrast images. This new automated correction collar utilizes a harmonic drive and automatic correction algorithm that enable users to easily achieve precise collar adjustment to achieve maximal objective performance every time. CV-1 cells expressing α -tubulin (green) and TOMM-20 (magenta) captured with CFI Apo TIRF 100x Oil objective. The λ series objectives, utilizing Nikon’s proprietary Nano Crystal Coat technology, are perfect for demanding, low-signal, multi-channel fluorescence imaging that requires high transmission and aberration correction over a wide wavelength range. Combined with new fluorescence filter cubes that offer improved fluorescence detection and stray light countermeasures such as the Noise Terminator, the λ series objectives demonstrate their power in weak signal observations such as single-molecule imaging and even luminescence-based applications. Even the slightest change in temperature and vibrations in the imaging environment can greatly impact focus stability. The Ti2 eliminates focus drift using both static and dynamic measures to enable faithful visualization of the nanoscopic and microscopic world during long time-lapse experiments. The newest generation of the Perfect Focus System (PFS) automatically corrects focus drift caused by temperature changes and mechanical vibrations that can be caused by a variety of factors, including the addition of reagents to the sample and multi-position imaging. The PFS detects and tracks the position of a reference plane (e.g. coverslip surface in the case of immersion objectives) in real time to maintain focus. Unique optical-offset technology allows users to maintain focus at an arbitrary position offset from the reference plane. The user can simply focus on the desired plane and then engage the PFS. The PFS then automatically and continuously maintains focus by means of a built-in linear encoder and high-speed feedback mechanism, providing highly-reliable images even during long-term, complex imaging tasks. PFS is compatible with a wide range of applications, from routine experiments involving plastic culture dishes to single-molecule imaging and multi-photon imaging. It is also compatible with a wide range of wavelengths, from ultraviolet to infrared, providing a means for maintaining perfect focus even for multi photon and optical tweezer applications. The Ti2’s Assist Guide function provides interactive step-by-step guidance for microscope operation. The Assist Guide can be viewed on a tablet or PC, and integrates real time data from built-in sensors and an internal camera. The Assist Guide is designed to help users through alignment procedures for both experiment setup and troubleshooting. Modern live cell imaging experiments demand optimal system performance, lost seconds can be the difference between failure and discovery. Most microscope software allows for control of imaging devices, including fast piezo z drives, filter wheels, and more. However, performance at the advertised device specifications is seldom realized in a real-world setting. So how does one maximize the overall speed performance of their system? Microscope devices are typically controlled using serial communication with the software, which introduces latencies due to checks/callbacks, lack of parallelization, and other factors. Nikon Instruments offers a comprehensive suite of solutions for maximizing imaging speed via hardware triggering: a control method using direct I/O voltage-mediated connections to drive system devices. The Eclipse Ti2-E is the world’s first completely hardware triggerable microscope stand. Native filter turret(s), filter wheel(s), and Z drive may be triggered using I/O connections on the microscope control box. Triggered experiments using the Ti2-E are designed in NIS-Elements and signals are managed using a National Instruments data acquisition device (NIDAQ), which has a far more precise timing clock than a PC. Software and hardware setup of devices for triggering is further simplified with our new NI-BB kit, a central hub providing predefined NIDAQ connections for all your triggered devices, including the Ti2-E.
Hardware triggering easily doubles (or more) the image acquisition rate compared to software control for a number of common experimental configurations (Table 1). Table 1: Comparison of experiment durations with typical hardware and experiment parameters. Hardware triggering displays a significant improvement in overall experiment time. In these examples, the camera exposure time is longer than the camera readout time for most examples. *The last row illustrates a comparison when the camera exposure time is the same as its readout time, and the camera can run in overlapped (100% duty cycle) mode. The placement of all of the buttons and switches are based on the type of illumination they control. Buttons that control diascopic observation are positioned on the left side of the microscope and those that control epi-fluorescence observation are on the right side. Buttons that control common operations are on the front panel. This use of zoning provides an easy-to-remember layout, a desirable feature when operating the microscope in a dark room. *2 Limitations apply based on objective and filter cube choice, stage-up configuration, and illumination module, etc. *4 Stage up kit is required. Please contact Nikon.